Smok Quantum 80w Review: Our Favorite Mod - Daily Vaping Deals & The Best Vape Product Reviews at Vaping Cheap! There have been tons of single 18650 box mods that have been released this year, but there has been one that has really caught my eye, and I have been enjoying the most out of all single 18650 box mods I currently own or have used, which is the Smok Quantum 80w Bluetooth OTA Smart Box Mod. Even though there is a lot of competition on the market for single 18650 box mods, this mod has truly impressed me, and it might not be the same for everyone, but there are a great amount of reasons as to why the Smok Quantum 80w is my number one choice for the best vape box mod single 18650 of Mid 2016. Upon first taking this box mod out of the packaging, the first thing I noticed right away was how small this box mod was. Granted, many single 18650 box mods are quite small, but it just looked tiny within the packaging. The box mod was protected within the packaging, and included I received a user manual (which I did not really use), and a micro USB cable upgrading the device. Upon first holding the device, I immediately noticed how light it was, and how great it felt in the hand. The Smok Quantum really felt of quality, and really shows how far Smok has really come with their products. Another thing I noticed about this box mod was the screen size, and even though it is only a single 18650 box mod, it does have a good sized screen, which I did appreciate with this mod. The box this mod came in was very clean, and was just simple and elegant looking. Also, something I did notice as well when first holding the device was how clicky the buttons were. Now, for me personally, I love clicky buttons on my box mods regardless if unregulated or regulated, clicky buttons for me is just a huge plus, which in this case, is. The Smok Quantum does feature temperature control for Ni200, Ti, SS and you can go into these settings to adjust TCR values, which was a huge pro for me. I typically do not use temperature control, as I prefer normal wattage mode, but I am very pleased that the option was there. The screen on this device is absolutely amazing, it shows the important information you would want to know, and this screen is bright! I had no issues when using this device outside when the sun was out, because of how bright the screen was. Also, everything was easily readable, and was just a pleasure to view. One thing worth mentioning is the fire button is also the battery door just like some other devices on the market. Now, I know this can bother some people as they may not be a fan of it, but honestly I really enjoyed using this device with this fire button style. The fire button is very clicky and responsive which was great. I do want to mention this, as stated some people may not like this feature. Another thing worth mentioning is that some of my atomizers with longer 510 pins did have a gap. This is something definitely worth mentioning as it did bother me (not too much), and I know for a fact that it drives some people crazy. Also, atomizers that were larger than 22mm did have some hangover, but not too much where I felt it did not look right. Up to 25mm atomizers I would say you can use on this device without it hanging over a lot. The menu system of the Smok Quantum was something I definitely had to get used to, because it was very different in comparison to most devices I currently own and use daily. It is not something difficult to get used to, but worth mentioning as it does take some time to get used to. I got used to it within the first week of using it, and never had an issue with the menu system. What really is great about this device is the OTA updates, where you do not even have to hook this device up to a computer to upgrade it! All you have to do is download the App on your smart phone, and put in your serial number in the App. After that you have a ton of features within the App where you can tune your vape, set up your temperature control, adjust your wattage, and tons of more! I think this is an excellent feature, and one of the key reasons as to why this device is my number one choice. The performance of this device was overall just excellent. Whatever wattage I used this device at, it never felt underpowered, and was instantaneous upon pressing the fire button. 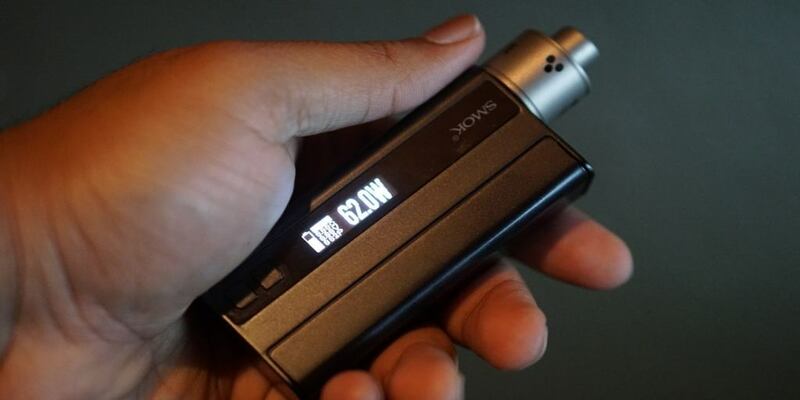 It is important to note that this device has a maximum wattage output of 80w, and a lot of other devices that use a single 18650 only fire up to 75w. Even though only a 5w difference, it still is a pro as it may be something people look at when purchasing a single battery device. When using this mod in temperature control, it definitely was working quite well, actually I think better than most devices I own. The temperature seemed accurate in comparison to a DNA200 device, and I only used temperature control in Ni200 and SS mode. Either mode worked fine, and gave a satisfying vape. When using this mod in normal wattage mode, it surely delivered the power even with Clapton coils! This was a huge pro for me, as with Clapton coils you do need a good amount of power for them to really ramp up, and with this device I never felt that it was sluggish or could not deliver a vape where I did not feel satisfied. 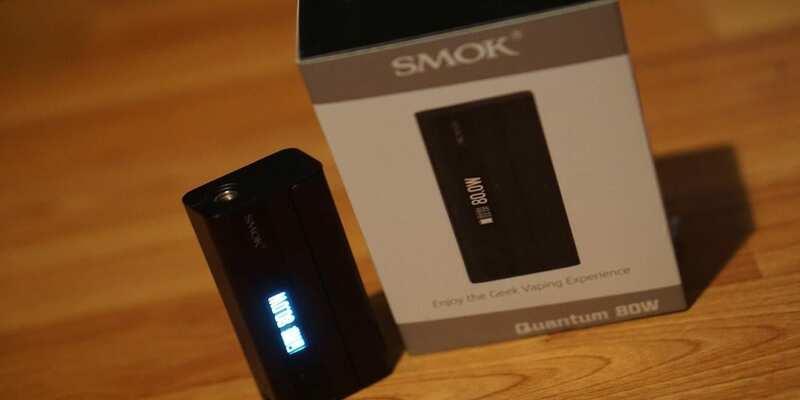 The updates on the Smok Quantum were relatively quick, but not as quick as it would be connected directly to a PC, which is expected as it is through Bluetooth. Still, I think this is an awesome feature, and is just convenient to the user. Overall, the performance of this box mod was solid, and never felt that this mod could not deliver a satisfying vape experience. Whether it was in temperature control mode or wattage mode, the Smok Quantam 80w was able to deliver flawlessly. In conclusion, the Smok Quantum 80w Bluetooth OTA Smart Box Mod is definitely a great single 18650 box mod. This mod packs so many features into a small form factor; it really is hard to beat. I know there are tons of single 18650 box mods on the market, but honestly none I have used or own has really delivered like this mod. 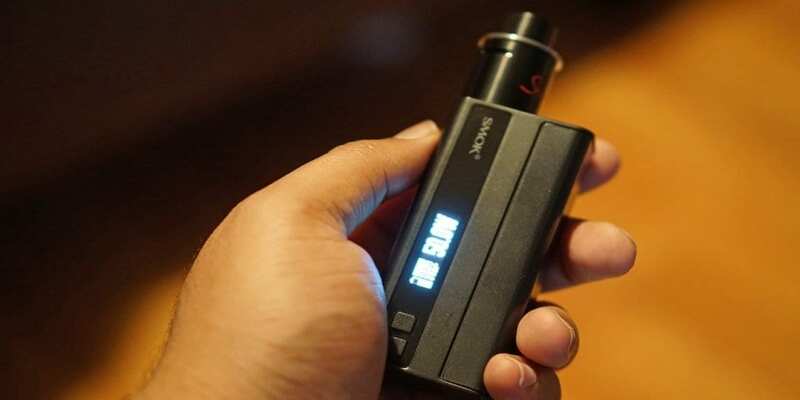 There were a couple cons that I did mention in this article, but honestly they were mostly minor things that could bother some people, but if you can deal with some hangover and a small gap with longer 510 atomizers, then this is a box mod surely worth considering. 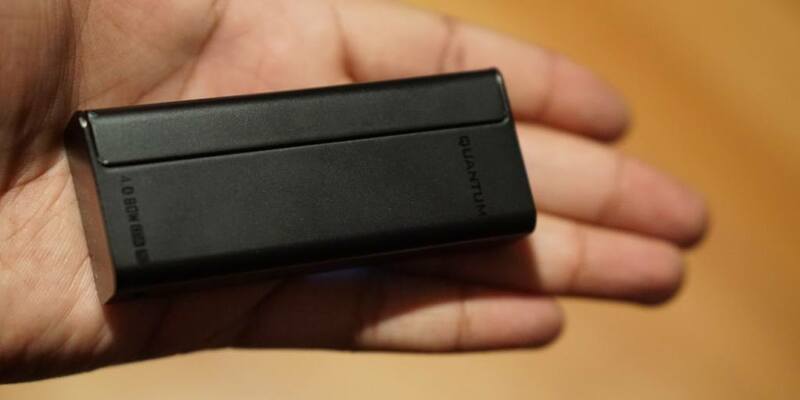 The price for this box mod is extremely good as well, and you do get a ton of value for your money with the Smok Quantum. Literally, almost any feature you could possibly want in a single 18650 box mod, this device has it. If you are in the market for a single 18650 box mod, then the Smok Quantum is definitely a device worth considering, especially with everything this device can do. This device really shows how far Smok has come with their products, and shows the direction they are heading in. The Smok Quantum 80w is definitely my choice as the best single 18650 box mod of mid-2016, and if you were considering this device before or looking for to purchase a new device, then this is a device that I highly recommend.